Aimed to help businesses thrive the MTA offers a wide range of services to its members. From networking events and exhibitions to marketing support and representation there is plenty for every business to take advantage of. You can find out more by clicking through on the relevant tags or if you'd like to know more about what matters to your business get in contact with our membership team and fix up a visit. The MTA sits at the core of engineering based manufacturing and as an association works tirelessly to ensure member companies are as commercially successful as possible. 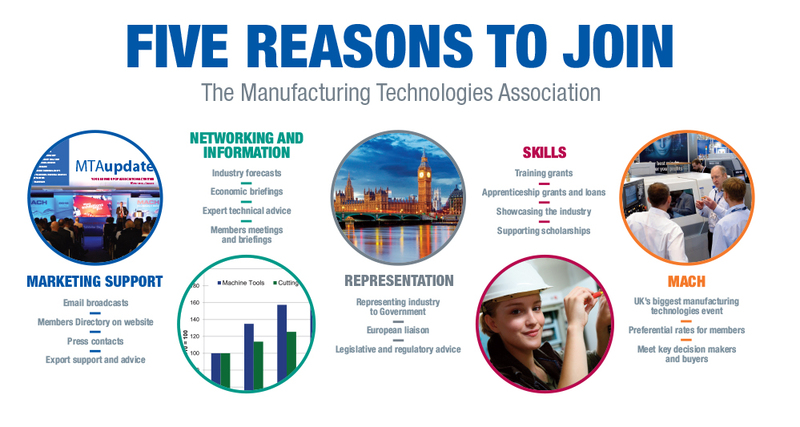 Membership of the MTA is open to all companies involved in engineering based manufacturing. Become a part of the Association and you’ll not only have access to our support and advice services you’ll also find a host of additional benefits. All of the above categories are subject to additional terms and conditions. Associate membership is open to all companies who do not fit into the above categories but have involvement in the industry – such as trade magazine publishers, banks and finance companies and advisory services. Small Business membership has been set up to small companies that are not eligible for full MTA membership due to their size or turnover. This membership helps such companies to grow and eventually become full members. Deborah Darnell in the South on 07824 513 254 or email ddarnell@mta.org.uk. Stephanie Young in the North on 07500 080760 or email syoung@mta.org.uk. You must be a UK registered company in order to qualify for membership. Non-UK based companies will not be considered.